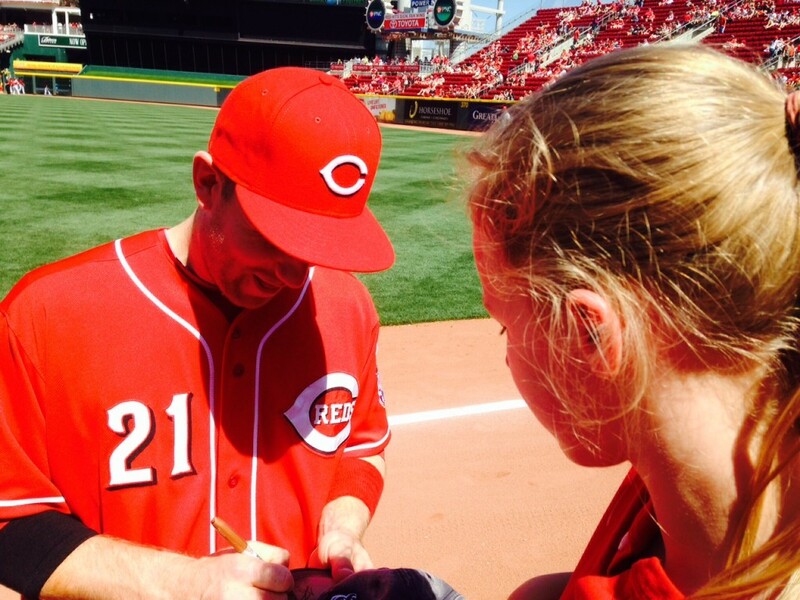 Two Saturdays ago, I’m standing along the first base wall at Great American Ballpark watching my daughter get an autograph from Cincinnati Reds third baseman Todd Frazier. It’s the first day of our family’s 8-day vacation that will take us to Cedar Point amusement park in Sandusky, OH, on to Niagara Falls, NY and back through the Smokey Mountains as we return home. The weather is warm and sunny and the look of excitement on my daughter’s face as she gets the autograph makes me realize why I love vacations. What a memory she will have of that moment. I can’t think of a better way to get our vacation started. I strike up a conversation with a couple standing next to us who were visiting from Columbus, OH. I’m interested in asking them how long the drive is from Cincinnati to Columbus because we intended to drive there after the game and spend the night on our way to Cedar Point. What they said next shattered my “this-vacation-is-starting-out-so-well” feeling. The kids were going to have so much fun and now would be incredibly disappointed. Perhaps the couple misheard the report and it’s not as bad as they let on. I tried to console myself with this notion. During the 6th inning my wife received an email from Cedar Point stating that it was indeed as bad as we had heard. Our reservations to stay at the park had been cancelled. Our plans foiled. What would we do now? Well, we learned the importance of being flexible. I love for things to work according to a predetermined plan…for there to be steps to follow…for point A to connect to point B and then C. When plans get blown up it’s easy for me to get frustrated. Does anyone else out there live in that boat? What I’m learning more each day is that being flexible is the key to tamping down levels of frustration when dealing with situations that don’t go according to plan. It would have been easy to become really agitated over this inconvenience. But what would my anger over a situation I couldn’t control produce? Probably nothing more than hurt feelings and more frustration, which would have led us to make a poor decision about what to do next. 1. We called Cedar Point to confirm our cancellation notice and receive our money back. 2. Next we called our hotel in Niagara Falls and to see if they had availability should we arrive early. They did, so we decided to travel there first. 3. Once the afternoon game concluded in Cincinnati, we drove to Cleveland instead of Sandusky to spend the night, rolling into our hotel about 12:30 am. 4. The next morning, we drove from Cleveland to Niagara Falls and spent the better part of two days there instead of the one we had originally planned. 5. While in Niagara Falls, we monitored the situation at Cedar Point. We learned the repairs had been completed and the park would be open by Monday. 6. Upon hearing that news, we called Cedar Point to reserve a two-night stay at the park and tickets for one day. 7. We left Niagara Falls late afternoon on Monday and arrived at Cedar Point late Monday night. We had a blast at the amusement park on Tuesday and left for the Smokey Mountains Wednesday morning. In essence, we ended up doing the first part of our trip backwards. It did cost us a bit more driving time and money for gas, an increase in expenses at Cedar Point (the original plan was a one night stay at the park) and our planned day at Cedar Point’s water park. This wasn’t a big loss though. Adjusting our plans in this way was worth it for the family to enjoy most of the activities we had originally desired to do. So on your next vacation, if things don’t go exactly as planned, try being flexible. Don’t get so worked up over the inconveniences that you create bad memories for your family. Instead go with the flow. Like those that faced us, a great many circumstances remain out of our control and it’s up to us to adapt and make the best of it. Questions: What’s your vacation nightmare story? How do you adapt to a change in vacation plans? Are you the vacation planner type or do you like to wing it and see what attracts you along the way? Do you have trouble being flexible? I plan like CRAZY so this is a tough one for me. I have started to build in a lot more “free” time into vacations and travel in general. We are going to Hawaii for 7 days this winter and I could easily cram 7 fully scheduled days into the vacation. Instead I think we will plan maybe 3 or 4 things we really want to do while we are there and then spend the rest of the time relaxing on the beach or doing something spontaneous. But I agree, you need to be flexible. When we went to Hawaii we had one big thing planned per day. But that activity didn’t take the whole day. For the rest of the hours, we just relaxed or did whatever popped up. You have to build in some relax/lounge time when you are in a tropical paradise like that. That’s all we can really do, adapt and adapt and move on like nothing happened. Good for you and your family during your vacation,. Life can never be predicted, every now and then there’s a rough curb, another obstacle to go through. How you come out of these struggles makes you who you are! Funny thing is all the maneuvering made the vacation a bit more exciting. We have a good story to tell/remember. When life gives you lemons…..make some really good lemonade, with just the right amount of sugar or add in a water park. I am the planner in the family. I usually like to have an itinerary with some flexibility in it for the unknowns. I don’t like to wing it because I want to maximize my time when on vacation but you have to have options in case something goes awry. There’s always a solution, you just have to stay calm and think of a different strategy as you did. Most importantly, you didn’t let this ruin your vacation. Nice Work! We probably did wing this vacation more than any other we’ve been on. It was a little out of my comfort zone but parts of doing that really felt good…to not be tied down to an itinerary. In July, 2005 we planned to circle from Houston to visit Avery Island and family in Layafette, LA, detour through New Orleans, go to visit Confederate sights in MS and head back home. Hurricane Cindy sprang up and was headed to NOLA, so we switched gears and went through north LA to visit Vicksburg first. When we did make it to New Orleans we were eating lunch at The Court of Two Sisters on the patio and it began to lightly rain. We finished quickly and went to look at antiques in The French Quarter and the rain wouldn’t stop. We finally sought refuge in an open-air bar, saw a scrolling news item that Hurricane Dennis was on it’s way and the mayor was calling for a voluntary evacuation. We decided that since New Orleans is below sea-level that we should probably leave rather than risk getting stuck (after getting beignets first – priorities! ), but told the boys that we’d come back – we’d talked up the food and jazz music so much they really were upset about leaving. About 5 weeks later Hurricane Katrina hit. You certainly dodged that one. My guess is you haven’t been back after Katrina hit? I have to admit, I definitely get discouraged when plans don’t work out, but as you showed here, being flexible and hopeful pays off! I’m glad everything ended up working out. The worst I’ve ever experienced was having to leave early as a hurricane was coming up the east coast. We got home about a half day ahead of it hitting! I would have left as well. Nothing is worth getting stuck in one of those. Flexibility is the key in more than just travel. It seems that at every point in life you run into roadblocks, things or people that move you off your chosen path. Often these roadblocks are things that are completely beyond your control. Having the understanding that there are some things in life that just can’t be changed, and the flexibility to adapt to the situation are going to save you a lot of stress over the long haul. You are so right Brad. If we had a bit more of this, with each other especially, it would produce a lot less interpersonal conflict. Haha…that’s hilarious that she enjoyed the waiting and being with the other kids. Just shows that we are more likely the ones to get stressed out over crazy situations, not our kids. Oh man I would have wept for you if you didn’t make it to Cedar Point. I freaking love that place so much and when I come home in the summer I always go there. I’m glad you were flexible and finally made it. But yes I can relate very much to the frustrating feeling bubbling up when things don’t go according to plan. I realize this is huge for me and need to learn to get over this hurdle if I want to be more Type B. There really is no other amusement park like it. I hadn’t been there in about 15 years. The rides are incredible. I’ve never closed my eyes on the first hill of a roller coaster before but did on the Millennium Force. 93 mph…wow! We were going to go on a family trip for Memorial Day weekend two years ago; however, there was an issue on the resort’s side and we ended up canceling and each of the families did something different. It was only two days before the vacation and my son was really looking forward to getting away. I immediately got to the internet and found an indoor water park not far from us, so we could drive, I used points for our hotel and we ended up having a great time. I think it’s important to remember that the whole reason why you are taking a vacation is to spend time together and at the end of the day, it doesn’t matter where you are and what you are doing, it matters who you are with. “…it matters who you are with.” Completely agree Shannon…that’s what makes vacations so special. I’m so glad it all worked out! But I am so shocked about CP! I’m from Cleveland and go to Cedar Point at least once a year and have never heard of this happening. Such a bummer, but I’m glad that it worked out ultimately. (Side-note, I lived in Columbus for the last 5 years before returning to Cleveland, so you really got a taste of my homes!). I hope you had a great vacation!! For it being a bad situation I thought the park responded well. There was no issue with getting our money back. And they even handed out free-one day passes to their water park as a gesture to those who originally had tickets. We didn’t end up using that for lack of time but I thought it was a good customer service gesture by the park. We were disappointed but what are you going to do? We couldn’t control the situation, only our response to it. Hey, I’m so glad it worked out! I can’t believe Cedar Point had to shut down like that. What a nightmare! I’m glad you found out ahead of time so you could alter your plans! It was pretty bad. There was an 8 ft. crack in one of the main pipes leading to the park. Once they dug up the area, it took them some time just to get the hole dry so they could work on it. I felt really bad for the people who were showing up on Saturday ready to enjoy the park and couldn’t.